Changed it up a bit this weekend and headed into southwest Montana’s Madison Mountain Range—the Lee Metcalf Wilderness Area—to be exact, to help a friend harvest a mountain goat. Having spent a lot of time in Alaska chasing goats, and having done the same thing in Washington state, right on the flanks of Mount Baker, I knew that it would be important for a friend to have some company. 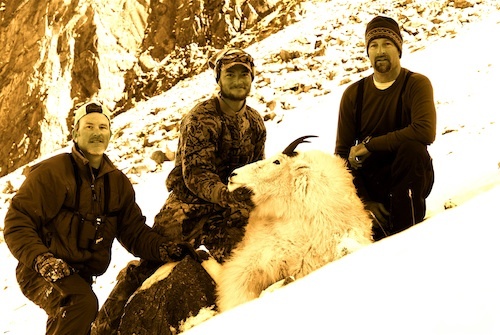 Hunting goats is downright dangerous and it is made more so if there’s snow on the ground. 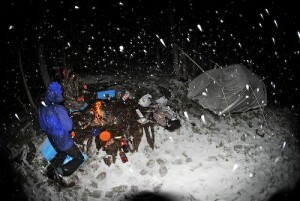 After hiking four miles in and setting up camp it started snowing. And the next morning the world was white. Mountain goats live on cliffs and near vertical slopes. This, I thought, had all the signs of a disaster. 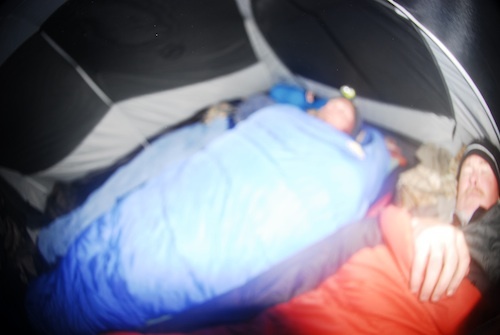 This is a spike goat camp on the first night of the hunt. But the two guys I hunted with, wolverine biologist Bob Inman and another biologist, Trent Brown, are tough as nails. The snow and terrain didn’t slow them down and by early afternoon of the second day we were on a goat, waiting for it to raise from its bed to provide Inman a good shot. And you want to put a goat down as quickly as possible because if you don’t it might hang up on a cliff where you can’t get to it, or it might fall off a cliff and break its horns off, thereby wrecking the potential for a trophy mount. This is what the area looked like when we woke up. Not fab goat hunting conditions. But then we spotted a goat and our energy levels shot up. side of the mountain from camp! Ouch. When we finally reached the goat it was 1,500 feet below the top of the mountain. 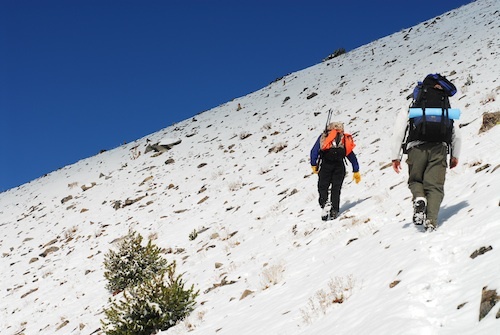 That meant, after caring for the animal and getting it into our backpacks, we had to, at times, crawl on all fours, with 60-pound packs, to reach a ridge that led to the top of the mountain. By the time I reached the top I was absolutely spent, heaving lungs, gasping for air at 10,500 feet. Then it was down another 1,500 feet, over rockslides and loose ground, to the bottom. Then a short hike to camp. I was ahead of the other guys and I built a big fire, dried my clothes, took the food down from a tree where we had hung it, and got dinner in the works. An hour-and-a-half later, the boys rolled in and we toasted with a little whiskey. We were tired and incredibly sore (at least I was), but we had Inman’s goat, our health and a heavy dose of adventure none of us will ever forget. A great goat hunt!